We now have our schedule for summer 2017 classes. 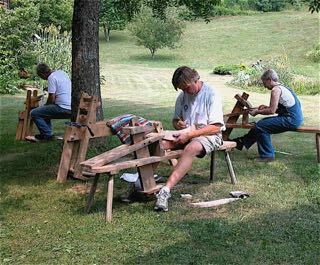 We will have two tutorials – our favorite and classic classes – Carving Bowls and Spoons, and Ladderback Chairmaking. Class size is limited to 4 or 5 participants (possibly including a summer intern.) Drew Langsner is the instructor. Louise will provide wonderful meals. As always, Country Workshops' tuition includes: your private room, all meals (beginning with Sunday supper before class begins,) course materials, and use of our specialized tools. You will be asked to bring more common tools, already owned by most woodworkers. A detailed description of each tutorial is on our web site. 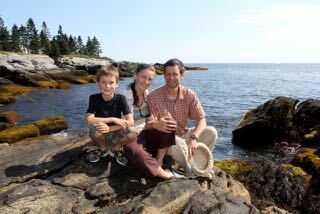 Conrad, Angela and Kenneth Kortemeier – at nearby Pemaquid Point. 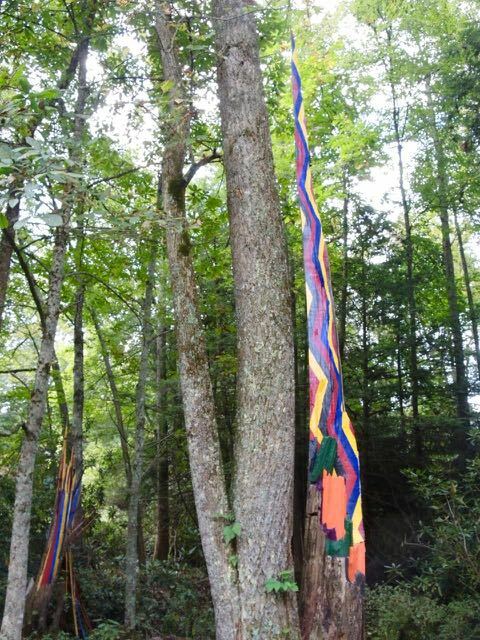 We are happy to tell the world that our good friends Kenneth and Angela Kortemeier will be offering workshops this coming summer at their new Maine Coast Craft School. You may already know about Kenneth who was our summer intern back in 1996. Since then he's been doing lots of beautiful woodworking and teaching – mostly at The Carpenter's Boatshop in Pemaquid, Maine. During this last summer, Kenneth was the co-teacher here while we explored the possibilities of the Kortemeiers phasing into running CW. By the end of the summer teaching season we realized that Kenneth really wanted to start his school at the Kortemeier home place on the Maine coast. In many ways, the Maine Coast Craft School is patterned after (or inspired by) the way that CW has operated. Kenneth is the principal instructor, although there will be guest tutors for some classes. The course offerings are quite similar to what we have been doing since 1978. Class size is limited to 5 students. The class day includes your lunch. Unlike CW, room and board is not included. There are several very nice accommodation and dining opportunities in the immediate area. You won't get our southern Appalachian mountains and forest, but instead you'll be in one of the most lovely areas of mid-coastal Maine. A good trade in anyone's book. 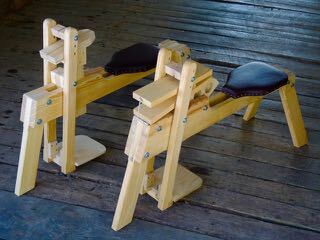 Shaving Mules made by Tom Donahey. 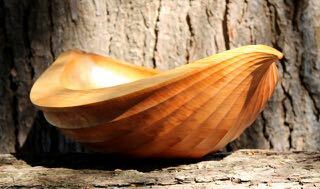 Most anyone interested in green woodworking, especially chair making and carving bowls and spoons, is well aware that there has been an explosion of interest in our once rather obscure woodworking passion. At least, that's how it appears from our insider's perspective. It's great to find so many people becoming interested and actually getting started. In addition to the learning part, there's the challenge of getting appropriate tools. At CW we've been helping with this effort, importing tools directly from Sweden, plus carefully picking a few suppliers here in the US. Until 2-3 years ago we were able to keep fairly good inventory of our most popular tools. Not so now. Both H Karlsson and S Djarv find that they cannot keep up with demand for their products. These are very small operations that cannot be scaled up when orders increase. As a result we have been back-ordered for many months this year. This effects our less popular tools in addition to the most wanted items. As this report is being written we are just now receiving our biggish orders placed back in May. The good news is that both the Karlssons and Djarvs tell us that everything on our orders will be delivered in the very near future. The last of 3 parcels from Svante Djarv should get here in the next few days. We have received 2 parcels (of maybe 6) from the Karlssons. About 60 customer back-orders were mailed last week, so the pile is getting smaller. Andreas Karlsson tells us that they are now "going all out" on our big order. Shipping to us is by air, so that takes about a week for tools to get to rural North Carolina from Sweden. If you have a standing order with us, please just relax. We pack and mail out as soon as inventory comes in. Yes, it's inconvenient that this is happening just before Christmas. But we are sure that you (or your recipients) will be very happy with these tools. Christmas Orders. We are sold out on many of our more popular tools, including axes, adzes and the most popular knives and gouges. However, we still have a selection of very special tools, books and videos. that will make excellent gifts (or maybe for yourself!) Here's a listing of current inventory and what will be available in the coming days as our new inventory arrives. 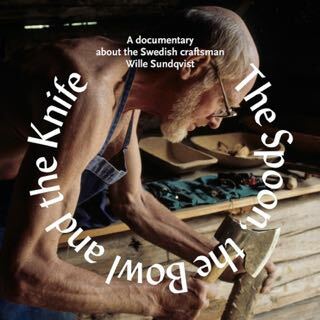 and his DVD "The Bowl, the Knife and the Spoon"
Jennie Alexsander's "Make a Chair From a Tree"
Jögge Sundqvist's "Swedish Carving Techniques"
Peter Follansbee's "Carving Wooden Spoons"
and "17th Century New England Carving"
Because of the very long (6 months) delay in getting new inventory we have decided to delay taking new orders on the most popular items that are sold out for 2016. These include our axes and adzes, and the most popular bowl gouges and carving knives from Karlsson and Djarv. We will announce availability, pricing and other details for these tools on our web site and in a forthcoming newsletter. We wish to thank our many customers who have been very patient waiting for their tool orders in the past few months. Now David Fisher shows us that thirds of a log can be used as a unique (and somewhat challenging) blank for hollowed-out bowl carving. The resulting shape is similar to what you can get with up-side-down (bark up orientation) in a half split. The radial splits become the side decks of the bowl. A lovely low sweeping sheer line happens almost automatically. And the two ends sweep upwards at what might be called the bow and stern. Note that the growth ring orientation is still the standard (bark down) orientation. In Dave's example (he says this is the first bowl that he's made from a third) the dramatic gouge work on the sides mimics the side planking growth rings that you get working bark up. Dave kept the sides quite close to the one-third radial splits, leaving the almost flat surface enhanced by skillful, very shallow gouge tracks. With this approach the profile sheer line and plan view are almost pre-determined. Low swooping sides and pointy high ends. One could add handles, but this would significantly lower the dramatic bow and stern. This terminology is from the boat world. But you can also see that the shape is basically that of many fruits/vegetables, nuts and seed pods. 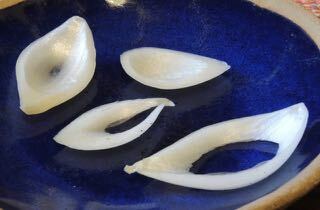 In fact, as this is being written I happened to notice a few onion slices on the kitchen counter. 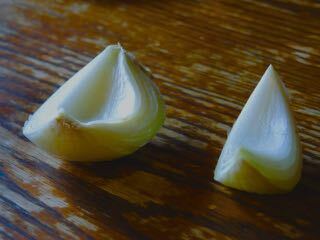 I apologize for the rather poor onion photos. I keep hearing this question – What will you be doing as CW winds down? At 74, I'm winding down just because. But also, I'm wanting more time to work on this 100 acre place, be with family and friends, travel, and maybe get the liberal arts education that I should have paid attention to as a young guy. And I find myself returning to the art world where I started out – before getting distracted with 40 years of learning about traditional craft and how to work wood with hand tools. Here are two examples of recent art projects. I've also been making smaller sculptural pieces from a hollow sugar maple that we've been looking at for many years, wondering what to do with another gift from nature. 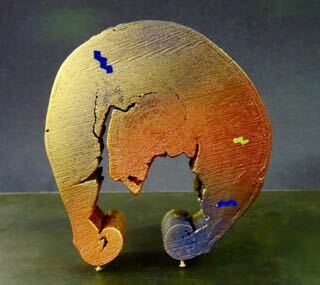 This piece is about 8 inches in height, painted with an air brush. I'll include more recent work (and maybe more text) in a future newsletter. This ash tree was riven by a wind microburst about two years ago. Dan Asher, who was our summer intern, helped to construct a sturdy scaffold so that I could get up there with acrylic paints. It's about 30 feet from the apex to the base.